“American higher education would be better off if more colleges tried to replicate what’s going on here,” writes John Tierney in his article about Champlain College, “What Would an Ideal College Look Like? A Lot Like This,” for The Atlantic magazine. 2017 EMPLOYMENT RATE: 94% of graduates from the Class of 2017 were employed or continuing their education within six months after graduation; of the 94% employed, 88% were already in positions related to their career goals. 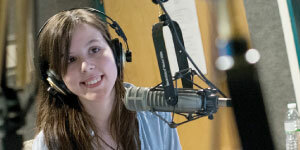 FINANCIAL AID: More than 90% of Champlain College students receive scholarship funds, which do not need to be repaid. What is Champlain doing that’s so different from the rest of higher education? Plenty. So much, in fact, that Champlain was named a “Most Innovative School” in the North for the third year in a row by U.S. News & World Report’s 2018 “America’s Best Colleges.” And the majority of Champlain graduates report they are landing jobs in their chosen fields within six months after graduation. Champlain’s enlightened academic model is what sets the Burlington, Vermont, school apart. Champlain’s majors reflect the careers and knowledge areas with the greatest potential for future opportunity. In addition to majors in high-growth, traditional fields like Accounting, Communication, and Law, prospective students can find cutting-edge programs like Computer & Digital Forensics, Data Analytics, Environmental Studies & Policy, and Game Production Management. 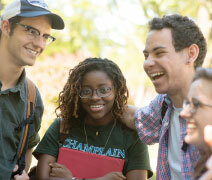 While Champlain has no general education requirements, its signature Core Curriculum offers a distinctive liberal arts experience; there are no exams, and students engage entirely in applied inquiry and experiential learning. Finally, Champlain’s InSight Program gives all students a four-year immersion in practical life skills in personal finance and career management. Champlain attributes its success to the professional faculty of world-class industry experts and the employers who make up the program advisory boards. Each year, these industry insiders develop and refine curricula to give Champlain students the most advanced, relevant, marketable, and effective education available in their fields. The Upside-Down Curriculum—perhaps Champlain’s most famous departure from higher-ed norms—incorporates as many as six courses related to a student’s major in the first-year curriculum. This early hands-on learning allows students to take internships sooner—and with greater frequency—during their college years. Champlain graduates who have held three or four internships are not at all uncommon. 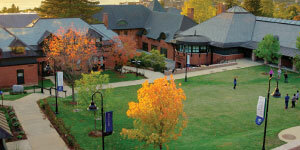 Champlain’s scenic hilltop campus overlooks Lake Champlain and the Adirondack Mountains. The campus, located in a residential area in the city of Burlington, features 20 Victorian-era mansion residence halls as well as award-winning modern architecture. The College highly recommends a campus visit for all interested prospective students.